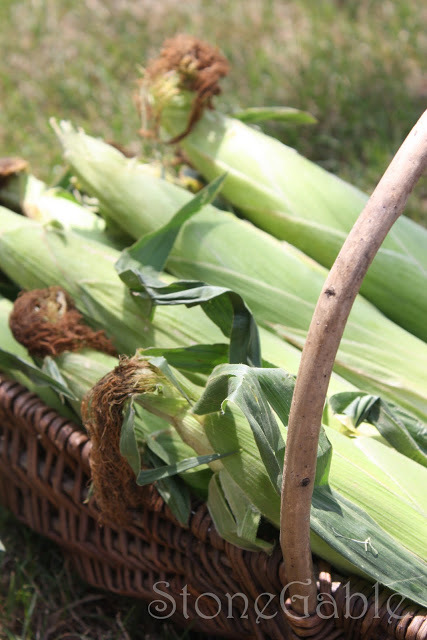 Our local farm markets and roadside stands are beginning to sell fresh local corn! Hurray! The corn from Georgia has been delicious this year, but I can’t help but love our local corn the very best. I get it early in the morning at the local “Corn Wagon” and it is on the table hours later! There is something that makes me feel very healthy and wholesome and fresh-scrubbed about getting produce right out of the field and onto my table! Supporting local growers and linking to an agriculturally rich heritage are very important reasons to eat locally grown produce. Not to mention the delicious satisfaction of doing something very worthwhile for my family. All from an ear of corn! Yes, it’s true! We are big soup eaters at StoneGable. Even in the summer. 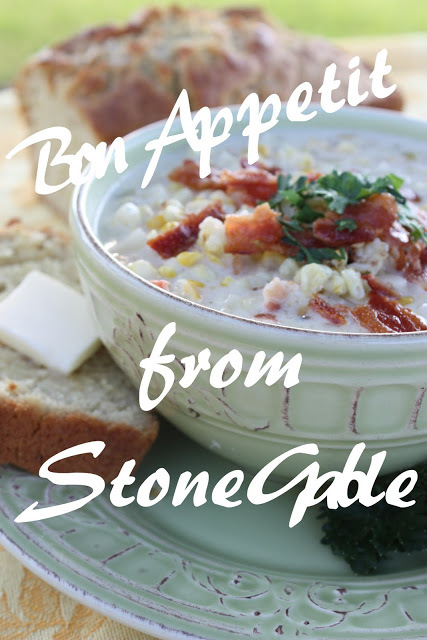 This easy recipe is a StoneGable original, after tweaking many different recipes. I hope you will not discount soup in the summer, the veggies are the freshest! I usually make a VAT of soup. Most soups freeze well and make wonderfully satisfying meals. Preheat grill. Husk corn and desilk. Brush with olive oil. When grill is preheated turn on low and grill corn turning frequently for 10 minutes. Some kernels will be browned. Do not let them char or burn. 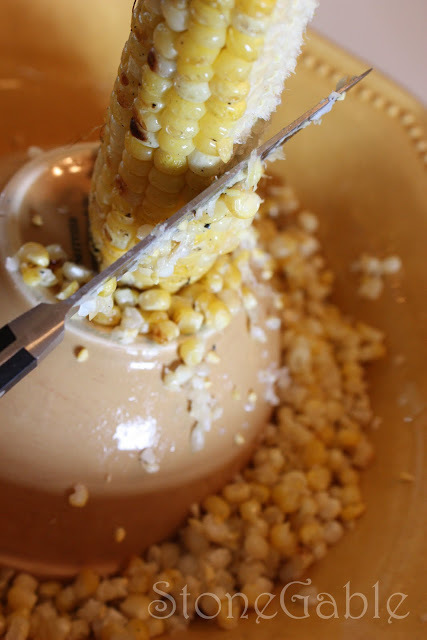 When cool scrape corn kernels off cob using a sharp knife. Invert a small bowl in a large wide bowl. Stand ear of corn on the stalk end. Holding the ear with one hand at the top, scrape the blade end of a sharp knife from top to bottom of the ear. Kernels will come off the cob and fall into the bowl. Scrape the corn cob clean. Meanwhile preheat oven to 400 degrees. 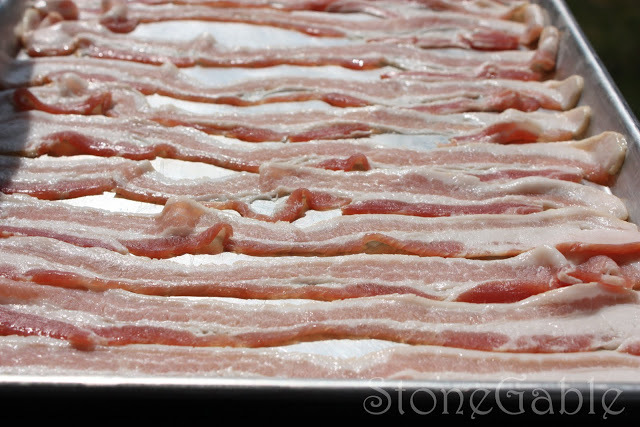 Lay out bacon on 2 large rimmed sheet pans. Bake for 20-30 minutes, switching position of baking sheets half way through baking. When crisp remove from oven and cool. Do not discard grease from 1 pan. Cut celery and onion and add to large stock pot. When bacon is done add bacon grease to stock pot with onions and celery. Cook over medium heat for 5-6 minutes, until onions are translucent. Add all grilled corn kernels but 1/2 cup to stock pot. Add potatoes, milk and creamed corn. On gentle heat bring to a simmer. Simmer for 15-20 minutes. Ladle into bowls and add extra corn and bacon to garnish along with a little fresh parsley if desired. Serve with homemade beer bread. This is the most requested homemade bread I make! Delicious, dense, and sooooo flavorful. The aroma alone will be worth making it. And best of all… this bread is sooo easy to make! It is great toasted the next day for breakfast, that is if you have any left! Heat oven to 400 degrees. Combine flour, sugar, baking soda, baking powder and salt. Mix to distribute evenly. Pour oil and beer over batter and mix by hand. Only mix until all the liquid has been incorporated, about 30-50 strokes. Turn out into a well greased loaf pan. Dot top of batter with butter. Bake for 45 minutes until risen and golden brown. Remove from oven and let sit in pan for 10 minutes. Turn out onto cutting board. We eat this bread hot out of the oven and crumbly. YUMMY! 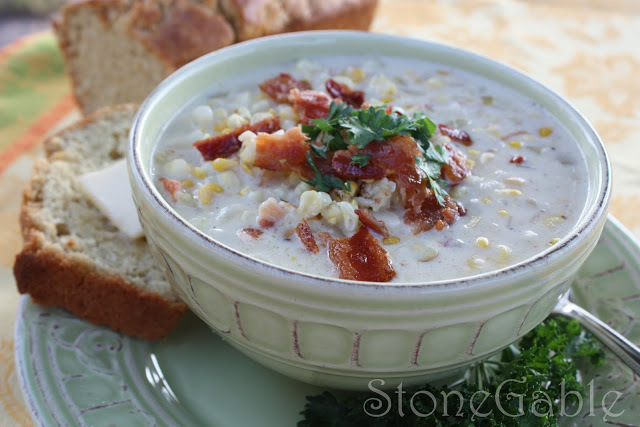 Enjoy a big bowl of Roasted Corn and Bacon Chowder along with a thick slice of Beer Bread! Remember to get seconds! It is a perfect and fresh summer meal! Thanks for letting me know! We love it here! 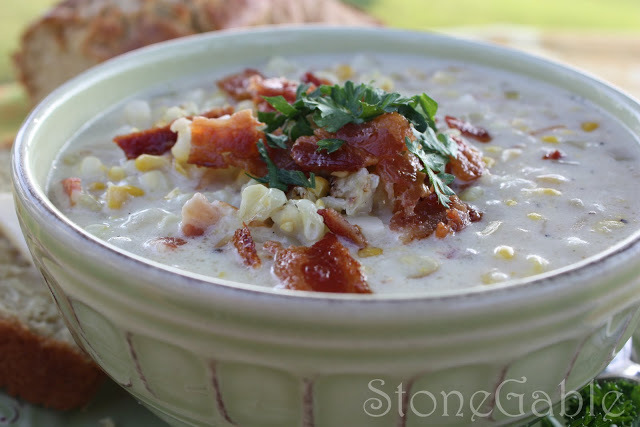 This corn chowder looks scrumptious ! I will be getting some of the ingredients today. I prepared corn this summer, so to the freezer I go. I think we might need soup in case this hurricane Irma decides to come our way. Lived on the east coast my entire life, but this ones scary! Prayers for Myrtle Beach, SC and the whole east coast. Thanks for your wonderful blogs! I really have to make this soup!! I’ve got the fresh corn. Want to try the corn chowder and beer bread. Yum. I so wish we could get a few cool days here -I am in baking mood, but just too hot yet. Corn chowder sounds amazing. Can’t wait to try it. I made the corn chowder 1/2 recipe to try Sooo good. Will be making it again w/beer bread for friends that are coming. Thank you for 2 great recipes. I am so glad that Cathy told me about your beautiful blog. Corn is still growing a-plenty at our neighborhood farmstand. Bacon is my husband’s aphrodisiac, so I will make MAJOR points with him, by making this. Thanks! Wow! that is a very lovely bowl of soup! I am going to find myself some corns! Thanks for showing us how to make this delicious looking soup! Fabulous photos! 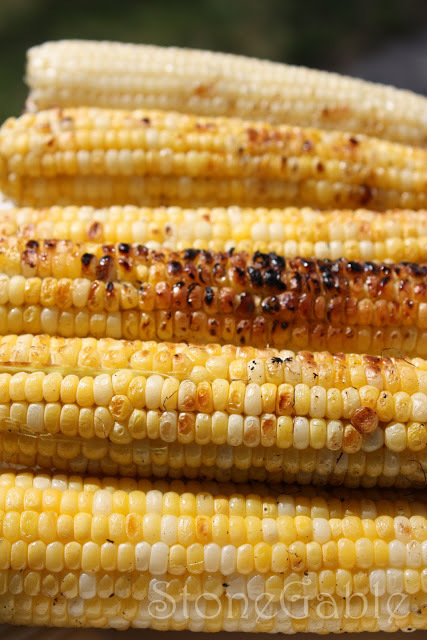 Roasting the corn is a great idea. What a wonderful soup…perfect for a chilly fall day:) Love the beer bread too. I was so inspired by this post that I made your chowder and beer bread tonight for dinner! It took a while, but it was definitely worth it! Plenty of chowder left to freeze, and it was all delicious!! Thanks so much for coming and being apart of Summer Sundays. Hope to see you next Sunday. So glad you’re back and blogging. These look like wonderful recipes. I LOVE roasted corn chowder. I’ll definately will try this recipe! What a wonderful recipe! I love corn soups and this one sounds especially good. I have been dying to try your little fruit pies in a jar since I saw them. I made two today and was just giddy while I did it. What a fun thing to do, maybe even as a party to have everyone make their own. I love individual desserts. I made a strawberry rhubarb and a Bing cherry one and they were both lovely and delish. Thanks for the fun idea. Oh geez gonna have to make this! The cinnamon rolls were AMAZING! My hips are growing as I read your blog! LOL! Wow! My mouth is watering and I have already eaten supper…this sounds and looks yummy. 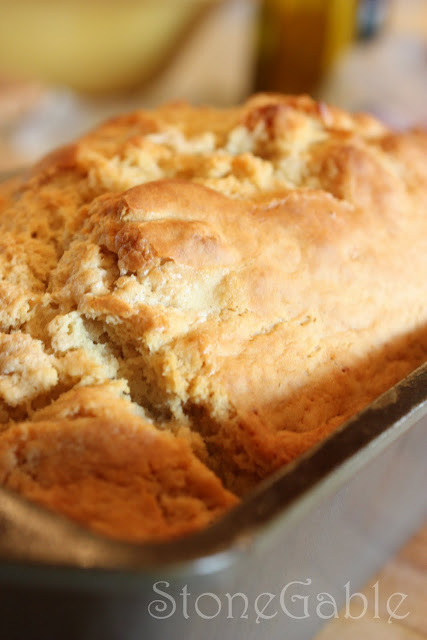 I havn’t made beer bread in years, but I remember liking it..thanks for sharing these two wonderful recipes with us! Soup is my “go to” food. I don’t care what season it is, I love a good homemade soup. I haven’t had any fresh corn yet and I live in the heart of corn country. The farmer we get ours from has been sold out every day by the time we get there. Tomorrow is my day to find corn and this soup will be on my table in the next few days. Yummy…I think I’ll do the bread too. I love corn chowder. This recipe looks awesome. I really love beer bread, too. That chowder looks delicious, but alas without air conditioning in the heat and humidity it will have to wait. I think I will grill some corn to go with rosemary balsamic marinated pork chops for supper. Oh, this looks so good! My husband could eat soup every single day of the year. I only want it when it is cold. I think this recipe is going to change my mind! It looks delicious! Thank you so much for sharing. I am sure my husband will thank you too! That corn chowder looks amazing!! 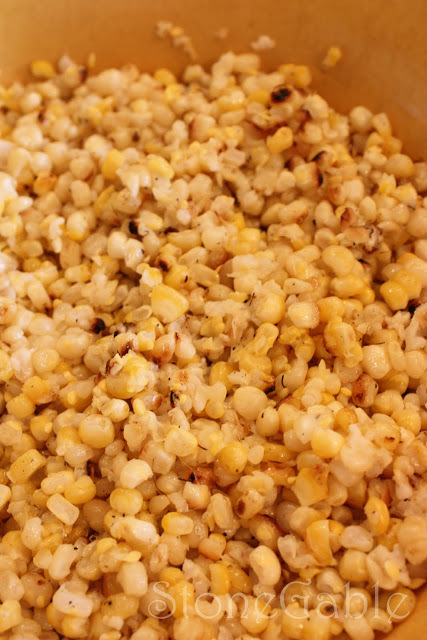 What an outstanding idea for using up some of our great local corn, Yvonne! We can’t est it fast enough & this would be a great way to be able to enjoy some later. Thanks for both recipes…they look & sound delicious. I concur with Jain…you are the best!!! You caught my attention with that soup…it looks SO good! I might just have to make my own version sometime. And beer bread is so good! I often times will make it with Sprite instead of beer – it’s excellent! I love beer bread but have not made any in a while. Now, after looking at yours I want some! Guess I will have to make some this weekend. okay, can i just come a live with you???? that soup….well everything is amazing. FAB. delightful. ….and those dishes!!!! i have a set for two just like them. yay. I just LOVE your blog, Yvonne. Everything about it is wonderful. It is truly a treat to come for a visit. I’ve heard a rumor that fresh corn will be available at my farmers market tomorrow and if it’s true I will have this mouthwatering soup on Sunday. Your photos are stunning. I love homemade beer bread and this chowder sounds perfect. Your comment last week about eating cream corn out of the can just cracked me up — I did the same thing! My cousin just sent me some corn from his farm and this chowder will help me figure out what I’m going to do with it all! Thanks. Delicious! 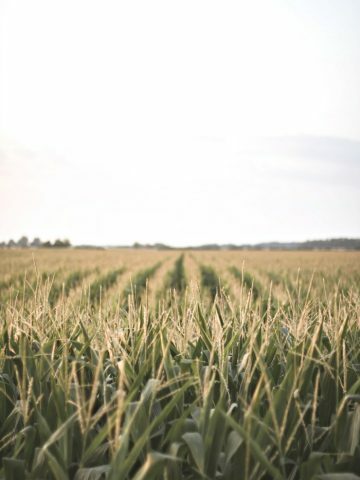 Corn and summer perfection. 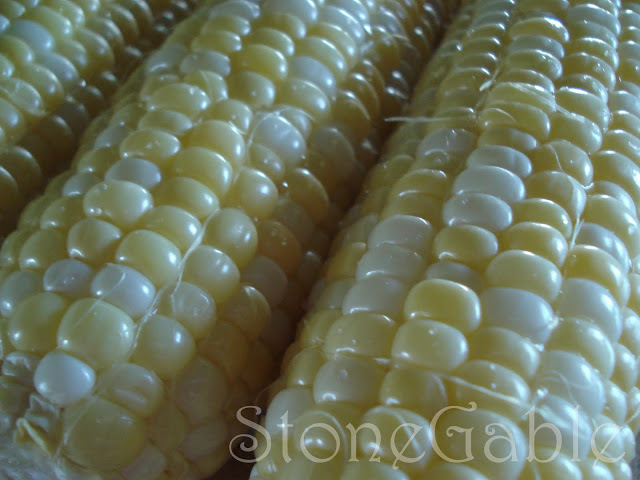 Our local corn will be in this week and I’ll be making lots of corn meals including your soup–and bread. Thanks! This looks like a scrummy soup. Will definately try it out. 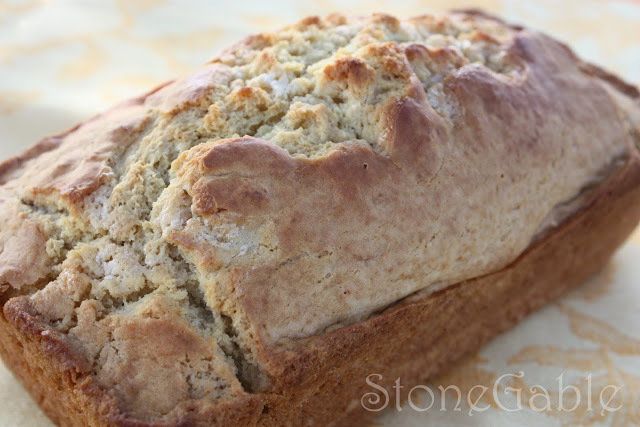 Your beer bread reminds me of my childhood when my dad would make a “pot bread” along with our “braaivleis” on lazy Sunday afternoons under the palm trees. 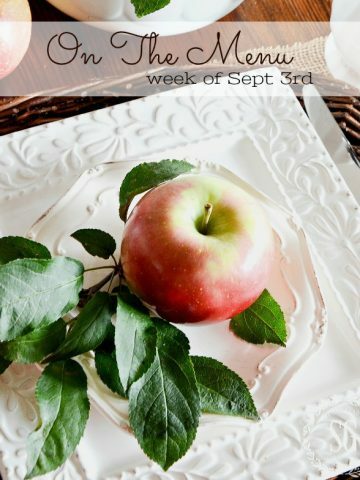 Super yummy post And your photos are eye catching — I found you from over at Harward (Juile) — she asked us to come on over and check out your blog — and so here I am — and very pleased at what I’ve read too — I’ll like to come again if you’ll have me — wink! I am now starving for this soup…it looks amazing. Your pictures are incredible, I would love to visit Stone Gable one day. Oh Yvonne, I am always looking for the perfect corn chowder and this one sounds absolutely scrumptious! I am marking both recipes as something to try! As always, your blog is one of my faves – thanks for making it always such a wonderful place to visit! Looks delicious! We love soup at our house, and corn. And bacon is always a hit! This week for FF I made corn cakes, and they would be so good with your corn chowder! Thanks for the placemat inspiration, too, they’re just lovely. 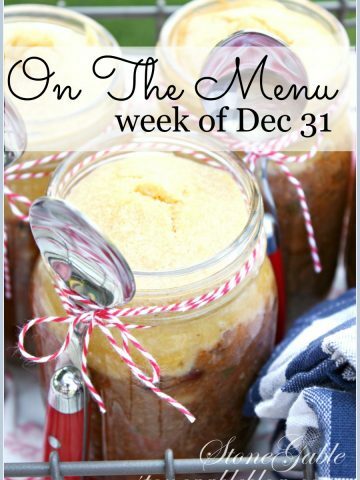 Hi Yvonne, oh my goodness these recipes look absolutely wonderful! I’ve made a corn and shrimp chowder recipe before – but not with the grilled corn. Can’t wait to try this at the farm!! Ciao, bella! Your soup looks divine–just what the doctor ordered. Thank you so much for your kind note. I deeply appreciated it. you NEVER disappoint with such beautiful posts. 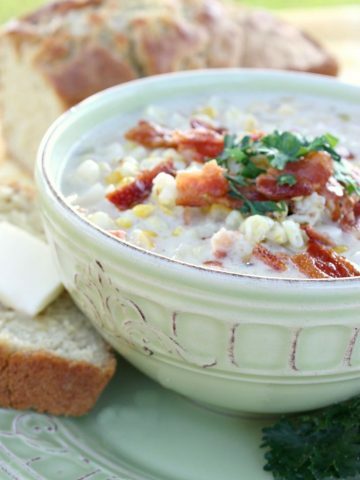 love corn chowder with bacon & homemade bread gets you the prize for the month. as always a mouth watering post in every way! Oh my!! That looks and sounds so, so good! Oh my heavens!!!!! Eating high on the horse this time around!!!! That just looks fabulous and I must try it!!! The representation of it all is wonderful!!! I know that must sound redundant after awhile, but really, your pictures are just wonderful!! A feast for the eyes! This soup looks so good! The corn is so delicious right now. I can’t wait to try this! You have outdone yourself on the chowder Yvonne. This is a must try. We love corn chowder in our house, so this recipe is right up our alley and the beer bread seems like the perfect accompaniment! Your pictures are magazine worthy. Looks great Yvonne! I always eat soup, will have cream of broccoli tomorrow as a matter of fact! While I’m a huge fan of the Artisan Bread in 5 Minutes A Day, I’ve never tried beer bread yet! Might just do that! Congrats to the ice cream winner, how fun! The corn chowder looks delicious! Congrats on winning the apron at Julie Harward’s blog. 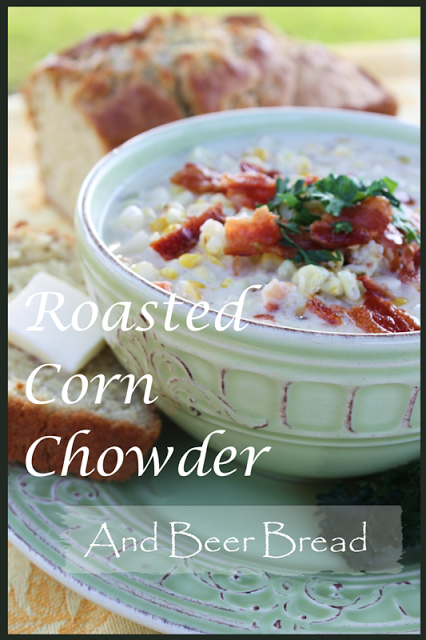 Oh My, I just love corn chowder and I bet this is especially good with the roasted corn!!! I like beer bread too but haven’t tried it with the sugar in it yet. I bet it’s even better.